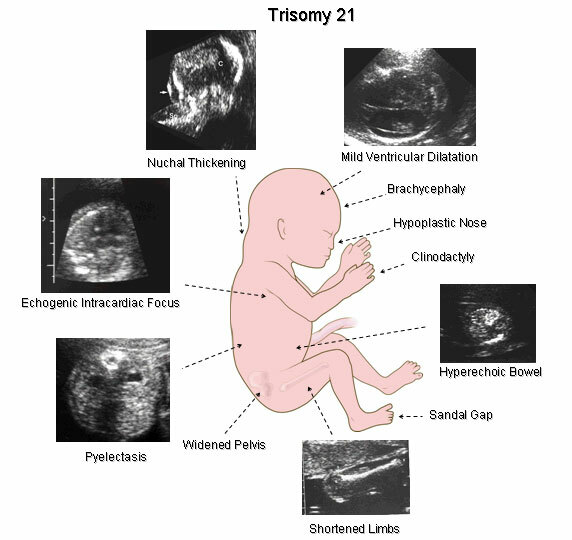 A number of ultrasound "markers" or potential markers for detecting fetal Down syndrome have now been observed during the second trimester. These markers should be distinguished from "structural" defects. Using a panel of ultrasound markers in a systematic fashion as a part of screening has been referred to as a "genetic sonogram". The presence of one of these markers may increase the possibility of Down syndrome. However, the chance of Down syndrome varies with the specific marker. Also, the ultrasound findings should be considered in light of other risk factors including maternal age, second trimester biochemistry, or first trimester screening if it was performed. A method for quantifying the risk of fetal Down syndrome based on the presence or absence of some of these selected markers has been described. (click here to see one of the key papers describing this method when sonographic markers are isolated). This method can provide a reasonable risk estimate of fetal Down syndrome (click here to download an excel file which can be used to estimate the risk). The use of ultrasound markers in this way is nearly identical to the use of biochemical markers as part of a panel. A number of centers and reports suggest that a second trimester genetic sonogram- when performed in a systematic way- can detect 60-80% of cases of fetal Down syndrome. These reports do not include incorporation of a "new" marker of absent or hypoplastic nasal bone. Although ultrasound can never eliminate the possibility of fetal Down syndrome, the absence of any marker- in other words a normal ultrasound- naturally reduces the risk. Recent studies suggest this risk can be reduced by a factor of 3 to 4, at those centers with similar high detection rate.